“A functional organizational structure is a structure that consists of activities such as coordination, supervision and task allocation. The organizational structure determines how the organization performs or operates. The term organizational structure refers to how the people in an organization are grouped and to whom they report. One traditional way of organizing people is by function. Some common functions within an organization include production, marketing, human resources, and accounting. You want to draw a functional organizational structure and look for the helpful software for this? Pay attention for the ConceptDraw DIAGRAM software! Extended with Organizational Charts Solution from the Management Area, it is ideal for functional organizational structure development. Organizational Charts Solution provides collection of organizational chart templates and samples, and also Organizational Chart library with 17 shapes for drawing organizational structure of any type - functional organizational structure, matrix structure, divisional structure, and many other types. It's very easy to create a functional organizational structure using the ready shapes. Simply drag the needed of them from the library and arrange at the document. All predesigned shapes are vector, so they can be easily resized without loss a quality, their color can be also changed at your discretion. The color accents on the charts often help highlight the important details. 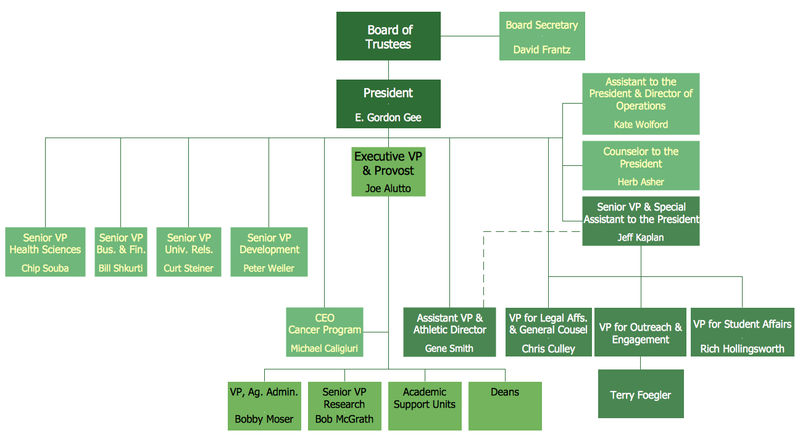 This Functional Organizational Structure was created in ConceptDraw DIAGRAM using the Organizational Charts solution from the Management area and shows in details the structure of the university. An experienced user spent 15 minutes creating this sample. 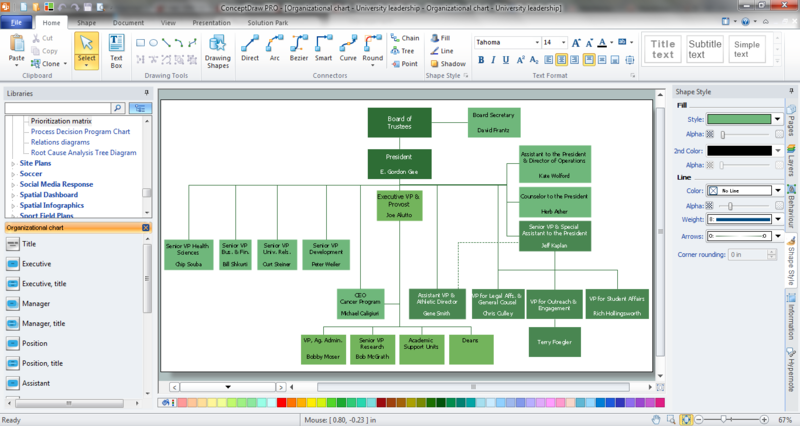 Use the Organizational Charts solution for ConceptDraw DIAGRAM software to represent the functional organizational structure of any complexity quick, easy and effective.